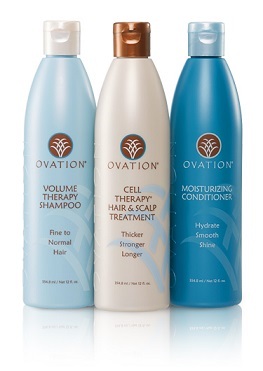 New Heat Activated Styling Product from Ovation Hair. D.C. Labs, the nationwide provider of the luxurious Ovation Cell Therapy® Hair & Scalp Treatment launches new Pure Volume Styling Solution. Ovation Hair has launched their new product innovation – Pure Volume Styling Solution. This heat-activated styling product is ideal for all hair types and the perfect compliment to Cell Therapy! Pure Volume has a proprietary complex that contains hydrolyzed wheat proteins, which help boost volume and texture, giving you a fuller, glossier blowout. Place 6-8 pumps of Ovation Pure Volume Solution into palm and apply throughout clean, damp hair. Dry and style with a blow dryer to activate the product and enhance volume. TIP: Section hair and apply evenly through each section, using fingers to distribute, focusing on the mid-shaft to ends. Note: The total amount used will vary by hair density, length, and porosity.